In many cases, employees are provided a vehicle by their employer with which to conduct company business. A classic example is a delivery driver who drives a company truck to deliver packages as part of his employment with the company. When company vehicles get into accidents, the people who are injured can often recover compensation from the driver’s employer. In Florida, a company, corporation, or other entity, such as a limited liability company (LLC) or partnership, is considered a “person” under the law, and persons are legal entities. The legal doctrine of respondeat superior, otherwise known as vicarious liability, stands for the proposition that an employer company may potentially be held liable for damages sustained by an innocent accident victim if their employee was at fault for an accident. Assuming that the employee driver was acting within the scope of his or her employment (i.e. “on the job”) at the time of the accident, the employer company can be held responsible for the employee’s negligence – even in cases where the employee was operating his or her own motor vehicle at the time of the accident. If the negligent employee driver was driving to or from work at the time the motor vehicle collision occurred, in many cases, the employer company is not responsible for the accident victim’s personal injuries and damages. However, the employer company may still be liable for damages if the employee is a traveling employee who was acting within the scope of employment at the time of the accident – or if the employee was on a “special errand” for the employer at the time of the accident. In cases where the negligent employee driver was not driving a company vehicle at the time of the accident, the accident victim’s insurance company may take the driver’s sworn examination under oath or send the driver an affidavit to sign regarding the fact that he or she was driving in the course of employment duties. In addition to filing suit against the negligent driver’s employer, you may also be able to file a personal injury claim or lawsuit directly against the negligent driver who caused the collision. In that case, coverage would likely come from the at-fault driver’s insurance policy rather than from the employer/company’s insurance policy. According to the Florida Traffic Code, drivers must operate their motor vehicles in a reasonable, careful, and prudent manner while on the road. When they fail to do so – or when they drive their vehicles in a careless, reckless, distracted, or negligent manner, resulting in an accident and injuries – then the negligent driver (or the driver’s insurer) may be deemed responsible for any injuries and damages caused to the accident victim. Motor vehicle collisions can be devastating experiences for everyone involved and can result in serious personal injuries and long-term damages. If you are involved in an accident that was caused by the driver of a company vehicle, you may be able to pursue monetary compensation for all of your injuries and damages arising from the accident. The knowledgeable car accident lawyers at Gerson & Schwartz, P.A. can meet with you to evaluate your claim and can negotiate with the insurance company adjuster for the at-fault party or parties. Our attorneys are also aggressive litigators. Consequently, if the insurance company refuses to place a satisfactory settlement amount on the table, our attorneys are not afraid to litigate your case through the Florida court system – or take it to trial, if necessary. Florida car accidents that result from a collision with a company vehicle can be especially complex from a legal standpoint. The car accident lawyers at Gerson & Schwartz, P.A. are experienced litigators and can take the necessary legal measures to safeguard all of your rights. 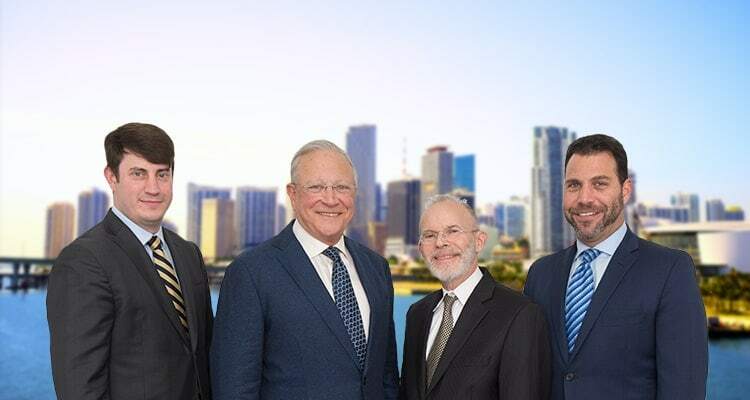 You should feel free to contact a Miami car accident lawyer at any time, via telephone or online, for a free initial consultation or case evaluation.